We have chosen to offer only the best scanner models from Epson, those suitable for enthusiast and professional imaging work. Each of these scanners is a combination unit, offering both film and document/artwork scanning capabilities. High quality film scanning is a real test of a scanner, and none these units are really 'Professional Level' like our own Film Scanning Service - however they are well suited to volume and proofing jobs, and for those cases where you're only printing at smaller sizes. Results with 35mm are quite soft by high end standards, but begin to get to a respectable level with medium format film sizes. Shadow penetration with the upper units in the range is decent, too. For film scanning, we fairly strongly recommend you go all the way to the V850 model, as its better optics and better workflow features really do make it a more pleasant and higher quality scanner. The V850 also comes with calibration targets making your accuracy out of the box significantly higher. (Also, see notes below about some better software you can use to get the very best results from these machines). The V600 is really not a great option for film scanning and we don't recommend it for this. Most likely you will want to look at the V600 model. For flatbed work, it's really very much on par with the higher price units. Whilst it lacks the out of the box colour management of the V850, you can add your own calibration targets and software to drive the scanner for much less than the price difference, and you'd be left with just as good (if not better) solution for flatbed work. See our software notes below for more detail. 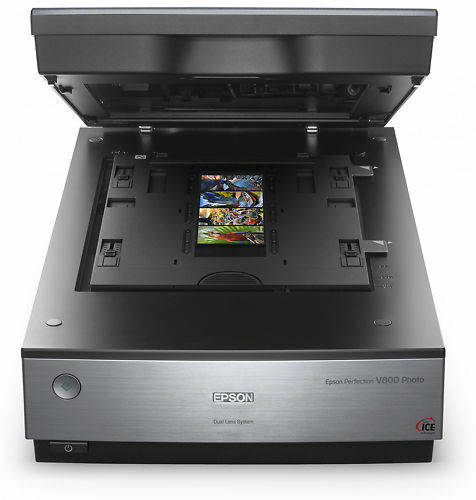 A high quality document and artwork scanner, but look at the V800 and V850 for film. A combination unit offering good quality artwork and film scanning. 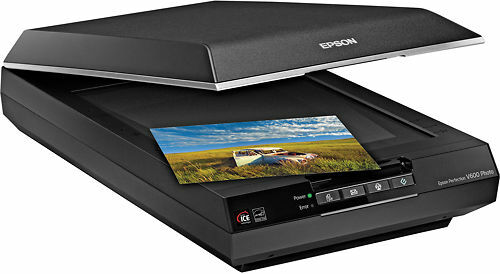 Epson's flagship film and document scanner, offering both better quality and speed. 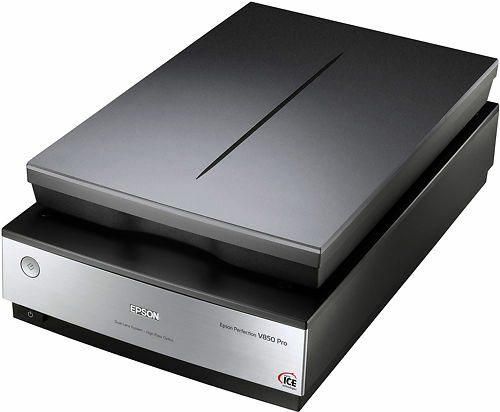 Epson Scan (all models) - a relatively simple, basic application for your day to day film and document scanning needs. Whilst simple to use, it doesn't offer a great deal of control over the scanning process and is easy to grow out of. Silverfast (V800 and V850 only - and version varies with model) - Silverfast offers a friendly wizard style interface and makes it much easier to get good results with your scans, especially with colour negative film. The V850 version is also notably better with Kodakchrome film scanning. Whilst the included options are good and relatively easy to use, there is an excellent after-market solution that offers much greater control over all aspects of your scanning - and we think it's the best solution from a quality perspective. Vuescan, at less than $100, is well worth considering. The learning curve is a little steeper than with the included software, but the level of control you can achieve is far greater as well. We've actually used Vuescan ourselves for some of our services for a solid 15 years now. Both Silverfast and Vuescan offer scanner colour calibration via IT8 calibration targets (the V850 model includes these, but they are also readily available online). These are known colour reference targets, and you simply scan these in with your software and they calculate a profile for the scanner - which can very significantly increase the accuracy of your results straight off the scanner. You'll still need some good Photoshop technique to get really high end, highly accurate results (and of course a good monitor and monitor calibrator are also essential!). Fine art reproduction prints are a great way of extending the reach of your art work.